Congratulations to Danny Chevalier, the 2011 Australia New Zealand Player of the Year. Danny managed to cash in five of nine qualifying events and overtook runner-up Leo Boxell at the very last qualifying event, ANZPT Darwin. For his achievement, Danny has won sponsorship into four Asia Pacific Poker Tour (APPT) Season 6 events, and either the Aussie Millions or PokerStars.net Caribbean Adventure (PCA) Main Event! 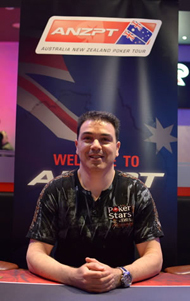 Player of the Year 2011 runner up, Leo Boxell, will receive sponsorship into five ANZPT Season 4 events. Third place finisher, Jesse McKenzie, has earned up to AUD$10,000 worth of buy-ins to main events in the Asia Pacific region, as determined by APPT and ANZPT management. Qualifying events for the 2012 Australia New Zealand Player of the Year will commence in the first quarter of 2012.